YWCA of Armenia – Women for a Better Future! During a recent trip to the Caucasus, I accepted an invite to visit the Armenian YWCA in Noyemberyan. The welcome was warm and I was honoured to have the opportunity to reconnect with YWCA sisters, deepen my knowledge and be inspired and challenged by their work. Although my time there was short, I felt incredibly moved and humbled by what I saw, the women I met and the stories told. Undoubtedly, the challenges for women and young women in Armenia are real and relevant to the worldwide YWCA movement. Of course, these realities and challenges are best communicated through the lived experiences of people. This short post gives an insight to some of the gender challenges in Armenia as shared by the women of the YWCA themselves. 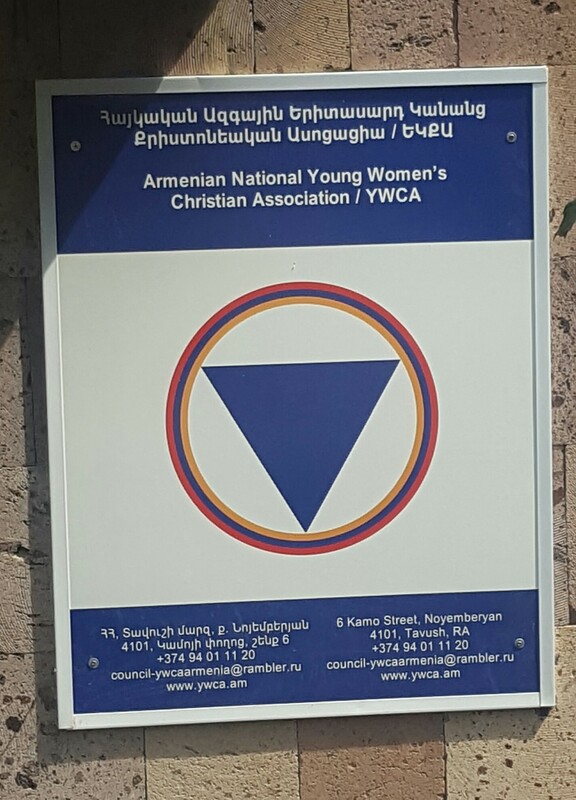 Welcome to the YWCA of Armenia! At a first glance Noyemberyan could easily be mistaken for an idyllic rural town. Nestled in the forested hills of Armenia’s Tavush province this bustling settlement oozes charm, magnificent scenery and a strong community spirit, but, dig a little deeper and you will reveal a long, complex and turbulent history. Located on the border of Azerbaijan, Noyemberyan is a town on standby. Ongoing tensions over the contested territory of Nagorno-Karabakh ensure that peace is fragile and has resulted in a substantial lack of investment in the area’s economy and infrastructure. I visited the small border village of Berdavan, a short distance from Noyemberyan, with Aida, President of YWCA Armenia. She grew up there. As she shared stories of deserted homes, untended work fields and lives lost, I was reminded of less peaceful times in Ireland, and my heart broke for Armenia and for the women for whom conflict is still a reality. When talking to a young YWCA member about women’s issues in the country, she stated ‘We must strive for peace first, then everything else will follow’. Never a truer word has been said – especially in a world where women are consistently and disproportionately negatively impacted by conflict and war. YWCA Armenia is an association limited in material and financial resources but rich in innovation, enthusiasm and achievement. Operating from a former soviet government building in the centre of town, these remarkable women oversee a kindergarten, sewing classes and a mini –gym among many other programmes and activities. In the summer months YWCA members congregate to freshen up the paintwork and redecorate the building. Perhaps what is most remarkable is that all this is done in a voluntary capacity, for the good of the community. What an inspiration to the YWCA movement, we can do it, even when the odds are against us! 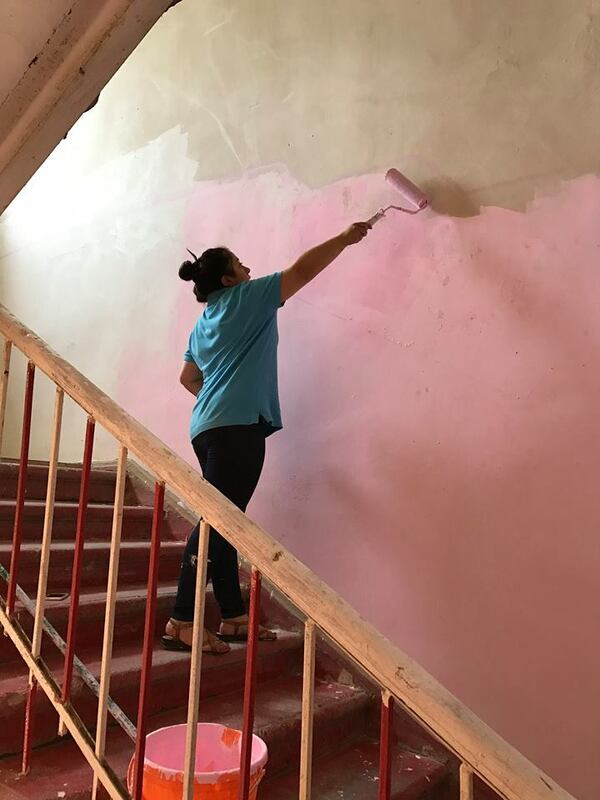 YWCA members spruce up the paintwork in their centre during the quieter summer months. 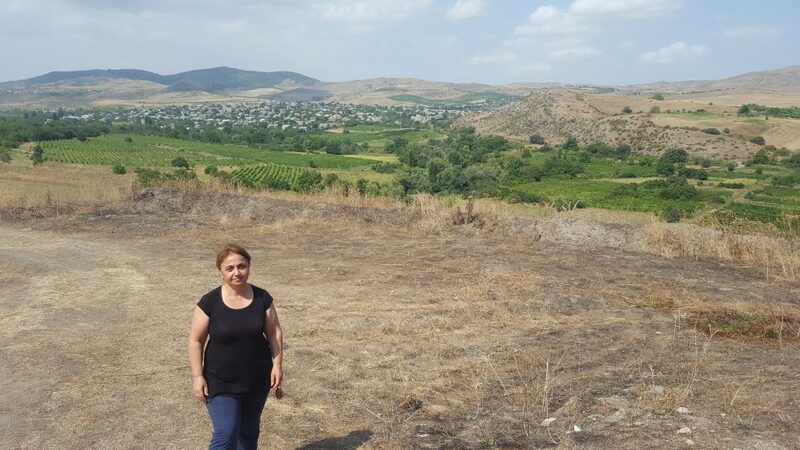 Like many rural communities in Ireland and worldwide, job opportunities in Armenia are restricted in rural communities, forcing many young women to seek employment further afield. The alternative is often unemployment or under-employment. I met Maryam who attends university in Yerevan and hopes to return to Noyemberyan as an English language teacher, however, there is no guarantee that a job will become available. Zhenni, a professional accountant, works on a local NGO project. The short term contract enables her to remain in Noyemberyan, close to family, for the moment at least. Lilit, Alina and Nune are young, creative professionals producing high quality fashion, pottery and glassware in their respective businesses. Their determination to do what they love, despite the barriers, is an inspiration to us all. For many young women in Armenia, pursuing the career of their choice in rural communities is a real challenge, made all the more poignant in a culture where families and communities are cherished highly and where many young people want to live in the communities where they grew up. Pizza, drinks and the cosy surroundings of the Chaplin Café Club provided the perfect setting for an unexpected Armenian/Irish culture exchange. Café club, heavily influenced by the YWCA, was established in response to the pressing need for a social and entertainment space for women in Noyemberyan. This is particularly important as coffee shops in the region have traditionally been men only spaces. With regular events, including cultural nights, karaoke and book clubs the YWCA use the café club as safe place for young women to connect with each other, have fun and to chill out. A truly brilliant initiative in a context where social and entertainment spaces are sparse. An Armenian/Irish culture exchange in the Chaplin Cafe Club. 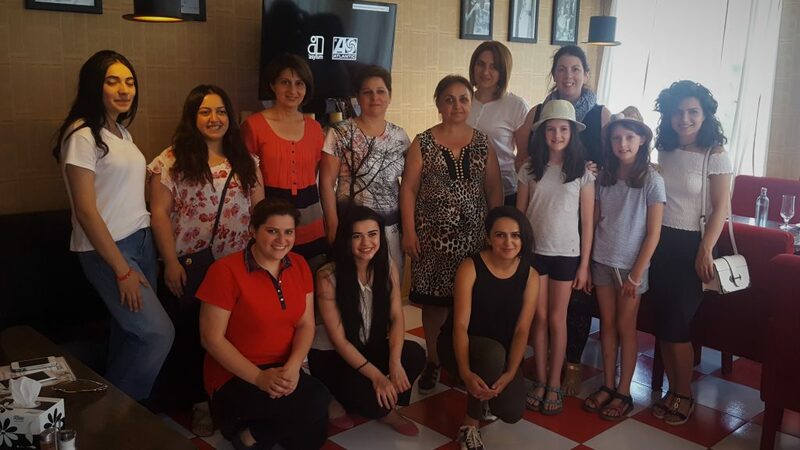 Pictured are YWCA of Armenia members with Audrey from YWCA Ireland and Anna – Leigh and Sophie Wilson. It seems fitting to end this post with a dream, the dream of YWCA Armenia. To buy and purchase a property of their own, to create a centre for peace and reconciliation and to provide accommodation for international visitors to come and experience Noyemberyan. Can the YWCA in Armenia realise and sustain such a huge ambition? If anyone can, THEY CAN!